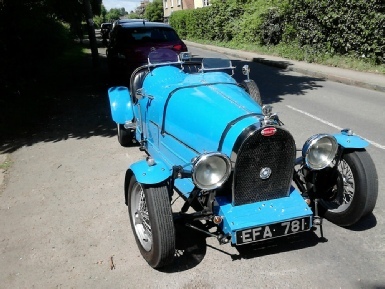 It turns out that this blue Bugatti EFA 781 is a replica built for himself by George Fearn. See a description of it here. The Bugatti in the photo (above) is very similar to the one owned by S/Ldr Pattinson. Same blue colour, it is Italian after all, and was a 2 seater, one driver and an engineer!! Outside hand brake and gear change so no opportunity for a bit of hanky panky excused as a fumbled gear change, and an exhaust sound to die for. The saloon was a bit more sedate, was it a 'Royale'? It was two tone in dark colours. In another email on 13 Jun 17 Bryan Hobbs said there were two Bugattis. One was a single seater blue car which always seemed to come home towed by a Landrover; the other was a huge black saloon with a long shiny engine. As it passed at about 30 mph one could count the piston strokes!